Today I have an awesome book to give away! 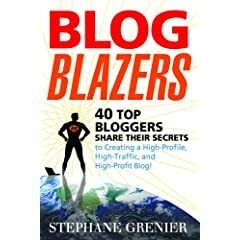 Stephane Grenier interviewed 40 bloggers for his book Blog Blazers including top bloggers like Aaron Wall, Yaro Starak, Neil Patel, Seth Godin, and Asha Dornfest. They all answered the same questions which makes for interesting comparisons. Topics covered include common mistakes, monetization, marketing, successful writing, what blogs they read, etc. I’ve learned a lot and have been reminded of the basic best practices to focus on and I highly recommend the book. I have 3 copies to give away thanks to Stephane! Please leave a comment before midnight US central time, February 7th, and if you have a blog, I’d like it if you’d put the URL to your most successful blog post ever in the Website field and feel free to tell us what you think made it so successful in your comment. That’s not an absolute requirement, but I thought it might be fun to read everyone’s best stuff! *I’m so sorry, but if the winners are shipping outside the US or Canada, I’ll need your help with the shipping costs.